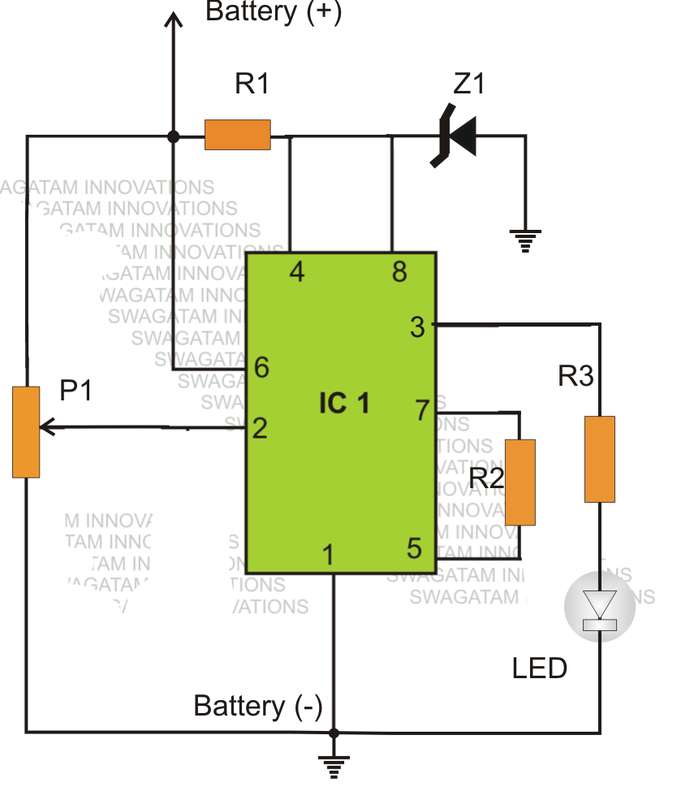 The article explains a simple low battery indicator circuit using the IC 555 and a few resistors only. Many electronic circuits such as emergency lights, battery chargers, UPS systems, flashlights etc essentially require a low battery indication feature in order to avoid over discharge of the involved battery. An over discharge could mean a permanent damage to the battery. A novel little low battery indicator circuit can be learned here, which incorporates just a single IC555 and a few resistors, it's a simple "plug and watch" kind of circuit. We all know regarding the basic characteristic of the IC 555 when it's being used in the comparator mode: if pin#2 is subjected to a potential lower than 1/3rd of the Vcc, the output pin#3 goes high. The above fact also indicates that pin#2 responds with reference to the supply voltage applied at pin#8 of the IC, which implies this voltage at pin#8 should be clamped to some constant level. Therefore in the proposed design the supply pin of the IC is fixed at some reference level using a zener diode. The battery voltage is allowed to reach pin#2 of the IC via the preset, which must be manually set such that voltage at pin#2 just falls below the 1/3rd of the zener voltage when the battery voltage reaches the specified lower threshold. The above setting can be done manually by applying a sample voltage to the circuit imitating the lower threshold level. Suppose, the specified lower threshold is 11.4V for a 12V battery, the applied sample voltage can be fixed at 11.4V and applied to the circuit. Next, the preset should be adjusted such that the LED just lights up. Now the preset may be glued by some permanent adhesive for preventing the setting from getting disturbed. The set circuit is now ready to be attached with the battery in question, whenever the battery voltage reaches the 11.4V mark, the LED would light up, providing the required low battery information. Z1 = zener diode, having voltage lower than the battery voltage.